There are times when iPhone 8 / iPhone 8 Plus get stuck on Apple logo while trying to boot up. It’s really when nothing happens and the screen just shows Apple logo. You are not able to do anything. No button will work properly. So what should you do when iPhone 8/ iPhone 8 Plus gets stuck on Apple logo? There are multiple reasons which causes your iPhone 8 to stuck on Apple logo. It can be a recent iOS system update that you installed. It may be jailbreak or malfunction of the iOS system in your iPhone. These reasons will make your iPhone unusable until you fix the issue. We are going to tell you few ways through which you can fix iPhone 8/ iPhone 8 plus getting stuck on Apple logo. When an iPhone freezes on Apple logo or loading bar then there are few ways to resolve it fast. One of the fast method to resolve getting stuck on Apple logo is to force restart your iPhone. iPhone 8 and iPhone 8 plus can also be force restarted to make go away of this problem. You can also force restart when your iPhone 8 or iPhone 8 plus screen freezes or your swipe doesn’t works as it should. You can also force restart your iPhone when your touches and gestures lag too much. Press and quickly release volume up button of iPhone 8/iPhone 8 plus. Press and quickly release volume down button of iPhone 8/iPhone 8 Plus. Press and hold side button or power button of iPhone 8/iPhone 8 Plus until you see apple logo. Once you see Apple logo then your iPhone 8/iPhone 8 plus will restart. Now it will work perfectly. 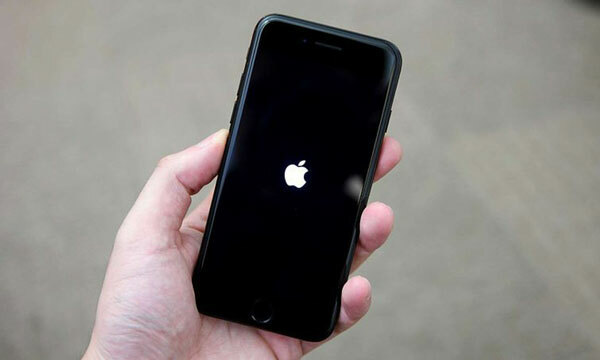 When your iPhone get frozen on Apple screen or stuck at loading bar or simply freezes at any app then you can enter into the recovery mode and update your iPhone iOS to get rid of these situations. Connect your iPhone 8/8 plus to a computer using Apple supplied USB cable. Open iTunes on your computer and update it if you don’t have latest version. Press and hold the side button/power button and volume down button until the screen turns off. Keep holding side button and volume down button even after the apple logo appears on the iPhone 8 screen. Once you see message “Connect to iTunes” message on iPhone screen then release the buttons. iTune will pop up a message which have “update and restore” option. Click on Update to update iOS. If update doesn’t work then you need to restore you iPhone. Restoring iPhone will delete all content and settings of your iPhone. The above method won’t work on iPhone 6/iPhone 6 Plus/6S. You need to press the home button instead of side button along with volume down button. If your iPhone 8 is stuck on Apple logo or loading bar while switching on then you can try DFU mode as the last option to fix your iPhone. DFU is device firmware upgrade. DFU mode will completely fix the phone by reloading firmware and software. It will also delete all the data and settings of your phone. Please backup your phone before you try out this method. Save all the important photos,videos, music and documents before entering into the DFU mode. Connect your iPhone to your computer/mac using lightening cable supplied by Apple. Open iTunes on your computer/macbook. Press and hold side button/power button and volume down for 10 seconds. Keep holding the volume down for 10 seconds and release the side button. If you will hold it right then your iPhone will enter into the DFU mode. iPhone screen will remain black. Once you are in DFU mode of iPhone, iTunes will pop up a windows. Click on “Restore” option to restore your iPhone 8/8 Plus. If any apple logo or anything else appears then you need to do above steps again. Hopefully you will be able to follow the methods and fix your iPhone 8. DFU methods works much better than first 2 methods but it will lead to data loss. Backup your iPhone before performing any action on your iPhone to fix the Apple logo stuck problem. This entry was posted in iPhone Settings on July 27, 2018 by satyenhacks.